Manufacturer : Cellresearch Corporation Pte. 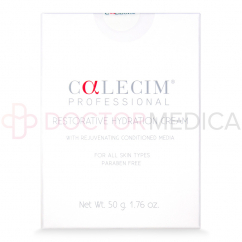 Ltd.
Order CALECIM Professional Restorative Hydration Cream from Doctor Medica. This nourishing and hydrating moisturizer can be purchased through our website, by phone, by fax, or by email. This cream comes in a 20g or 50g jar. 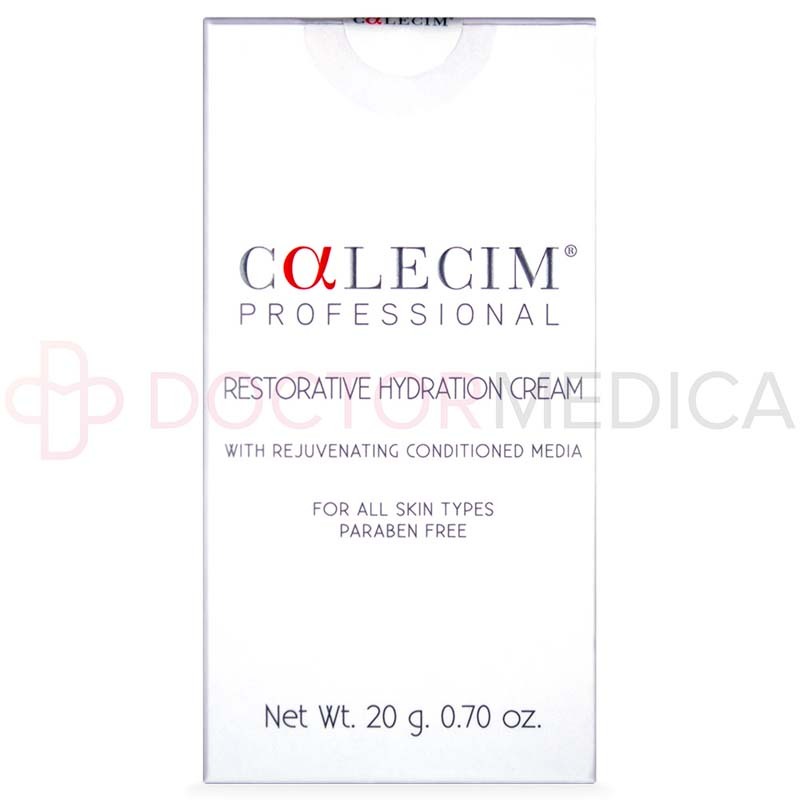 CALECIM Professional Restorative Hydration Cream is a lightweight moisturizer that revitalizes dehydrated, tired skin displaying minor signs of aging, by deeply hydrating all layers of the skin. It is suitable for all skin types, even sensitive skin. This cream is made of 30% Rejuvenating Conditioned Media (contains consolidated peptides or glycoproteins, soluble collagen, albumin, fibronectin and hyaluronic acid), aloe vera, tocopheral, glyceryl stearate. As skin ages, it loses its youthful vigor through the loss of elasticity, volume and strength. A good skincare routine can help restore some of the lost vitality by replenishing the skin with moisture and supplementing it with ingredients that work to restore youthful dermal structure. This anti-aging cream works through the action of its key ingredient, the unique and patented CALECIM Rejuvenating Conditioned Media. This formulation of cytokines and growth factors that encourage epithelial proliferation and renewal ensures that the cream goes beyond moisturizing—it actively restructures skin from within, resulting in clearer, smoother, and softer skin. Not only that, the presence of naturally-derived hyaluronic acid helps the skin to stay moisturized, soft and supple. This cream is also formulated with aloe vera, an ingredient with soothing, antioxidative, and hydrating qualities. Other anti-aging ingredients like the vitamin E derivative tocopherol and glyceryl stearate provide further protection against free radical damage and skin-conditioning benefits. 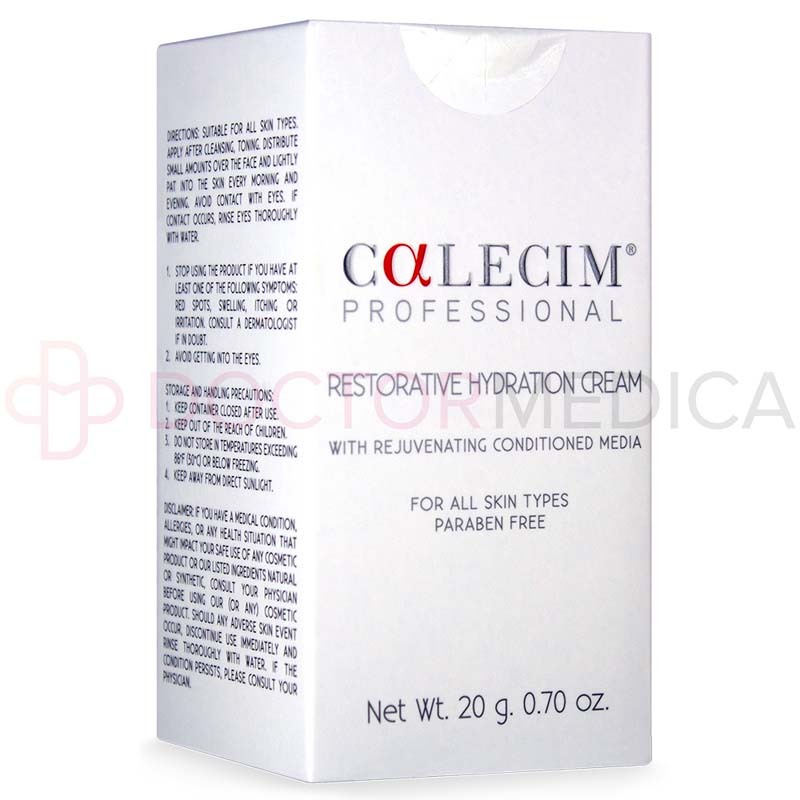 For optimal effects, use CALECIM Professional Restorative Hydration Cream as part of a daily skincare routine. Apply the cream after cleansing, toning, and the application of a corrective cream like CALECIM Professional Multi-Action Cream. To use, dot small amounts of cream over the face and lightly pat into the skin. Make sure to cover all areas of the face, all the way back to the skin in front of the ears and up to the eyelashes of the lower eyelid. Use this cream daily in the morning and evening for best results. If used as recommended, visible improvements will be apparent after 2 weeks of use with optimal effects seen after 90 days. 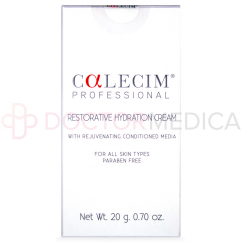 CALECIM Professional Restorative Hydration Cream plumps and hydrates skin from within. Use it as part of a regular skincare regimen to combat the signs of aging and bring radiance back to the skin. This facial cream is suitable for use on all areas of the face, neck and decollete. 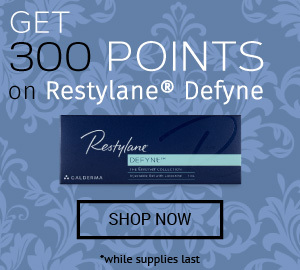 Use only on healthy, unbroken skin. With regular use, skin is visibly improved in texture and fullness. These benefits remain as long as the product is used. Patients with stubbornly dry and rough skin or who exhibit the early signs of skin aging will benefit from this product. 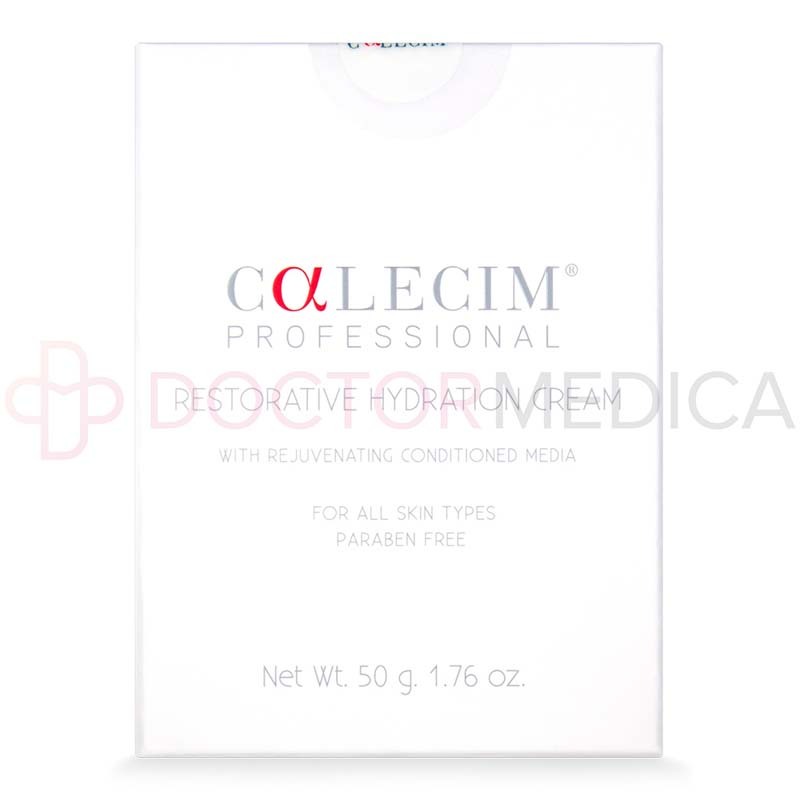 Packed with anti-aging and hydrating agents like hyaluronic acid, aloe vera and patented and uniquely formulated Rejuvenating Conditioned Media, CALECIM may be the solution they were looking for. Patients who are looking for a skincare product that improves skin texture, hydrates and softens fine lines to manage their rough, thin skin that is exhibiting minor signs of aging will benefit most from this product. 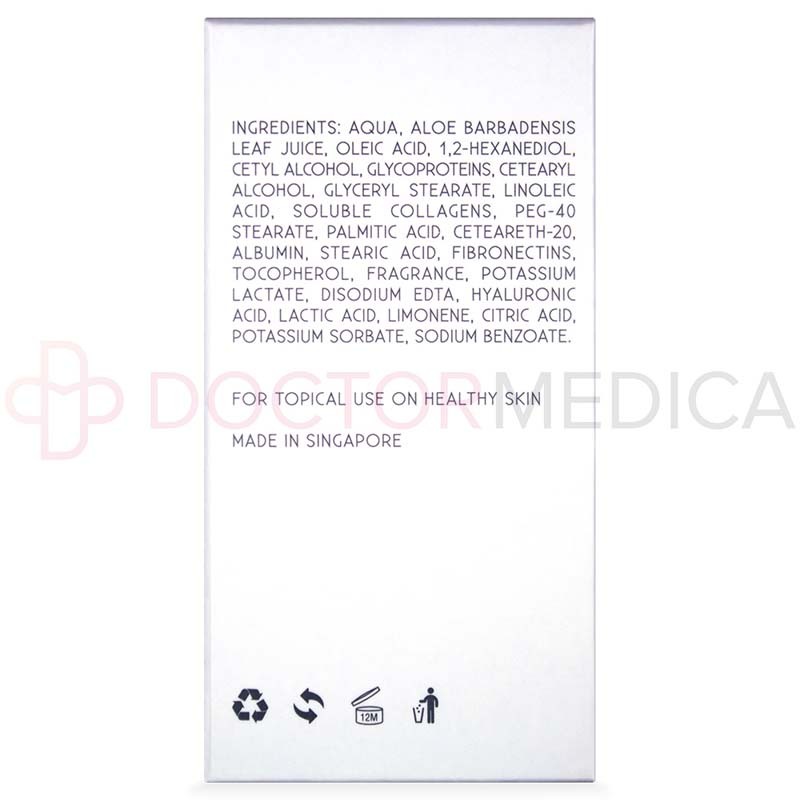 Generally suitable for all skin types, but patients with active acne should refer to their doctor before using this cream. Also, patients with health issues, allergies or other medical conditions that may interfere with safe use of the product should consult their doctor prior to use of the product. There have been no reported unintended side effects related to use of this skincare product. An expected effect that may occur is the development of pimples. This is due to the regeneration of skin, and is a result of the shedding of old skin cells that have accumulated on the epithelial surface. If the skin breaks out in this manner, it is recommended that the patient temporarily stops use of the product for a week before continuing after. If the condition still does not abate, the patient should fully discontinue use of the product. If any adverse reaction to this skincare product occurs, including irritation, rash, hives or itching, the patient to wash the product off with water and discontinue use. Should symptoms get worse with time, or if symptoms continue, the patient should seek medical treatment. This list is not exhaustive.